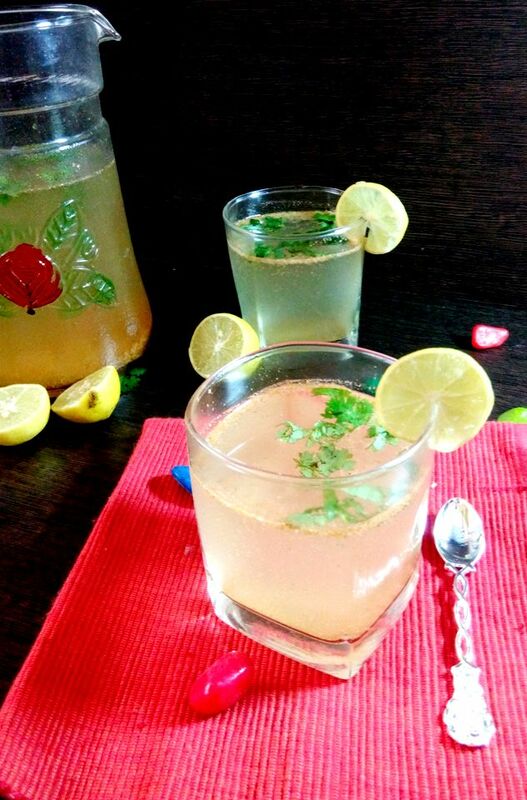 This Masala lemonade is very special to me!why....well this was what I and my hubby used to order in pizza hut during our courtship.Rest of the time used to go in blushing and smiling.But the sweet and tangy taste of this drink is still on our tongues. So I assume that the taste of this drink must be extraordinary for us to forget everything while romancing and remember only this drink. Cut to today ....this drink is regularly made at my place.Oh no no not to remember those days but it is actually lipsmackingly yum. The best part of this recipe is its fuss free as always !!! Lets start recreating the magic. And what more romantic than the Mumbai rains outside. Grind well in mixer and you get home made jaljeera juice. Pour chilled water in a large jug.Add sugar and stir well. Add lemon juice,jaljeera juice,crushed ice to the jug. When ready to serve,add soda . 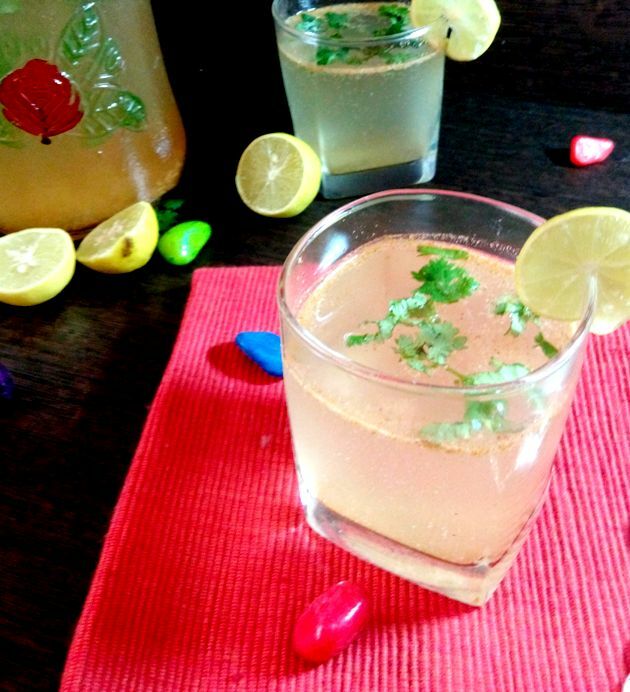 Serve in chilled glasses,garnished with coriander or mint leaves. This sounds like something I would enjoy. I'm not sure about my husband! The problem for me would be procuring the ingredients. I will "fake it" with mint, cumin, fennel and black pepper. Visit India Lydia....we can have it together.Thanks for liking the recipe. This is very different from the lemonade that I'm used to having. I'd be certainly open to giving this recipe a go. Thanks for sharing! Glad you liked it Byron. What a lovely story behind the recipe! I'd really like to try it at some point. Sounds super interesting! How interesting! I love all those spices & herbs! I'll have to find out what asoefritida is! Asoefetida is very good for digestion .I am sure you will get it in a supermarket which sells Indian spices.Thanks!